In the capable hands of Jérôme Clementz, this bike has probably won more enduro races than any other. 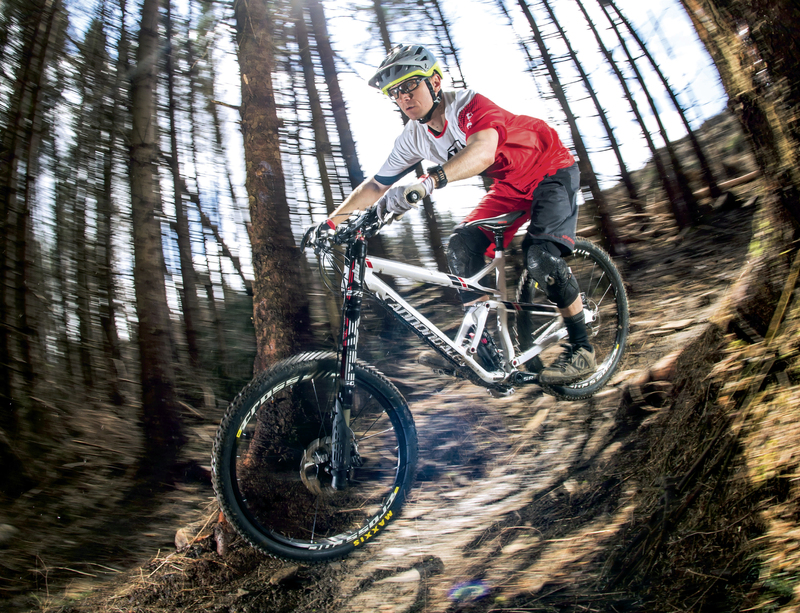 Most significantly, Jérôme rode it to victory in the inaugural Enduro World Series in 2013. It’s also a bike with a long heritage; the earliest Jekyll — complete with Lefty fork and innovative ‘trunnion mount’ geometry adjust system — appeared way back in 2001. For 2015, the latest version has been refreshed to accommodate 650b wheels. It also gains 10mm of travel and gets a slacker head angle combined with extra length in the frame. What it retains are its bespoke suspension components and completely unconventional approach to design and engineering — more on that in a minute. The Jekyll frame is carbon-fibre from tip to toe. It’s immensely sturdy too, with wide-stance 15mm axles clamping the shock link to the front triangle and seatstays, and a full 1.5in head tube enclosing a straight, oversized steerer. Bolted between the BB30 bottom bracket shell and swing link is the unique DYAD pull shock, built by Fox. Unlike most shocks, the shaft is pulled out of the body as the suspension compresses. It’s compact in length, and being tucked down low in the frame means weight distribution is improved, while creating enough space for a bottle cage. Cannondale has long steered a unique course on the suspension front, believing strongly in a system integration approach, rather than simply assembling a number of off-the-shelf components. The single-sided Lefty fork and DYAD shock are obvious embodiments of this principle. 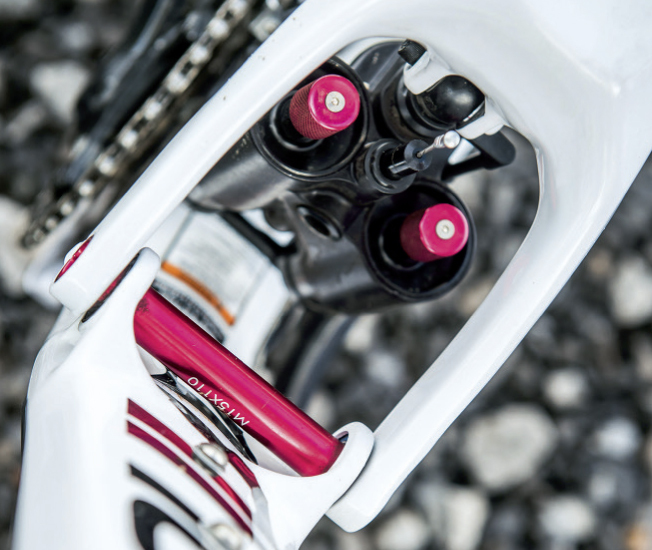 In SuperMax form, the lefty fork it delivers 160mm of travel. The air-spring and damping circuits are both crammed into a single leg, attached to the steerer tube by a dual crown arrangement. Against all preconceptions, the Lefty is exceptionally stiff, and with only one leg, you can fix a puncture without removing the wheel. That’s a good thing, since this involves removing the brake caliper before you can unbolt the hub from the stub axle — a right faff. The DYAD shock runs relatively high pressures, and, at first, set-up looks daunting. But the sticker on the back of the seat tube gives all the info you need and, combined with the sag indicator, takes most of the headache out of getting up and running. 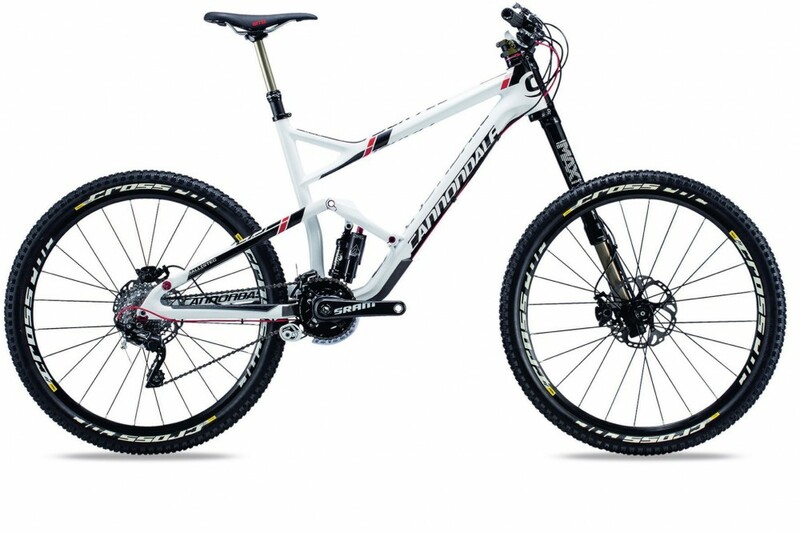 Forget subliminal messages, Cannondale pulls no punches in marketing the Jekyll as a successful enduro race bike. Yet, it comes with a narrow, 740mm bar, 2×10 drivetrain and, worst of all, semi-slick Mavic Crossroc Roam tyres. We can overlook the double- ring drivetrain on a bike that will likely be ridden up big hills, by riders without pro-level fitness, but fitting tyres better suited to a towpath is simply not good enough. Out of the box, the Jekyll has the head angle of a trail bike and the bottom bracket height of a 10-year-old downhill bike. Combined with the long fork offset (50mm versus 42mm for the Pike and 44mm for the Fox 36) of the Lefty, it made for an unbalanced, precarious ride with unpredictable steering. By changing the balance between the DYAD’s positive and negative air pressure, we were able to let the bike sit deeper into its travel, producing far more confidence-inspiring handling. Obviously this ate into the total travel, though, and the Jekyll would feel out of its depth earlier than other enduro bikes. We couldn’t fault the stiffness of the Lefty fork, but it didn’t give a particularly lively or sensitive ride, and on the roughest trails we really had to wrestle with the skinny bars to hold our line. In Elevate mode, the Jekyll climbed efficiently enough, but at 31lb, it never really displayed the urgency and eagerness we had anticipated. While we applaud any manufacturer with the guts to turn its back on the herd, there were definitely moments on the Jekyll when we thought the bike would be better with a more conventional, off-the-shelf, fork and shock. When your bike boasts a travel and geometry adjust system, there is no reason to hold back with the numbers, yet Cannondale has done just that. The Jekyll’s geometry is far too conservative, with a head angle more suited to a 140mm bike and a bottom bracket that’s 15mm too high. Coupled with the extra fork offset, every black-graded trail we took it down became a shade darker.